Be the first to share your favorite memory, photo or story of Colleen. This memorial page is dedicated for family, friends and future generations to celebrate the life of their loved one. 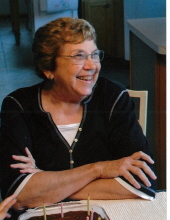 Colleen Marilyn Rapp, 82, of Iowa City, died the morning of October 19, 2017, at home, after a long illness. Colleen was born August 12, 1935, in Tara, Iowa to Rodney and Opal Walker. She graduated from Fort Dodge High School. Colleen went on to earn her B.S. degree in education at Ottawa University in Ottawa, Kansas. She taught elementary education in Kansas, Arkansas, Keokuk and Cedar Rapids, Iowa. She also taught preschool and Sunday school. She married Waldean on August 18, 1957, recently celebrating 60 years. They had 3 children and 8 grandchildren. Colleen was a sweet, caring daughter, sister, wife, mother, grandmother, aunt, cousin, and friend. She was devoted to loving and caring for her family. She enjoyed watching her children and grandchildren in sports and other activities. She was a faithful Hawkeye fan. Colleen is survived by her husband Waldean, brother, Delbert (Clarice) Walker, children Bill (Heather) Rapp, St. Louis, Ann (Jeff) Mason, Iowa City, Sandy (Rik) Logan, Portland, Oregon. Grandchildren, Tommy, Matthew and Sean Rapp, Kyle, Natalie (Matan), and Mollie Mason, Amanda and Carly Logan. Colleen was preceded in death by her parents and infant brother. In lieu of flowers, memorials may be directed to The Colleen Rapp Memorial Fund. To send flowers or a remembrance gift to the family of Colleen M. Rapp, please visit our Tribute Store. "Email Address" would like to share the life celebration of Colleen M. Rapp. Click on the "link" to go to share a favorite memory or leave a condolence message for the family.